This academic thesis considerably aided the process of evolving the South Downs to National Park status. In view of its important findings, not always sympathetic to National Park status, it is published here to aid scholars in furthering the understanding of the South Downs and protected landscapes generally including the Malvern Hills. This document is a snapshot in time based on the last decade of the 20th century. Of particular interest is the evolution of thinking and action based on the foundations set out in this thesis. Details of a summary publication of the quantitative findings are given at the end of the Bibliography. Dr. Bruce E Osborne, BA(Hons).,M.Soc.Sc.,D Phil. Culture, Development and the Environment. AN EVALUATION OF THE NATURE, IMPACT AND MANAGEMENT OF TOURISM ON THE SUSSEX DOWNLAND. "Sussex is Sussex on account of the South Downs. Their peculiar landscape, their soil, their uniformity, give the county all its meaning" - Hilaire Belloc. The thesis seeks to address two interrelated issues. The first is the nature of tourism impact and whether it can be orchestrated to provide social, economic and environmental benefits. The second considers the future conservation designation for the Downland, whether it be AONB or National Park. The thesis opens with an examination of what makes the Downland a special place and the mechanisms that are in place to perpetuate that differentiation. Recreational tourism on the Downland, it is concluded, is far broader than traditional definitions suggest. The infrastructure of tourism is also examined. In the review of earlier related research it is apparent that data specific to the Downland is lacking. A major Visitor Survey is embarked upon. From the results the characteristics of Downland visitors are determined. Two case studies provide insights on the managing of the relationship between recreational tourism and landscape conservation. This leads to a discussion on the validity of various management strategies and techniques. The debate then moves to social implications of tourism. Tourism provides a valuable alternative to the changing agricultural industry. The Visitor Survey data determines that the Downland is a substantial economic generator. Against this background a debate is initiated on the potential benefits of a public land holding for the redeployment of former agricultural land. Both case studies are shown to have substantial public open space. This Downland deficiency is considered alongside future designation of the Downland. The conclusion is that special AONB status is appropriate with a nucleus of inalienable land. It is argued that the Downland can continue to be a special recreational resource although it is acknowledged that some restoration work is required. Tourism becomes the enabler of environmental conservation but it will require bold policies and leadership to secure the vision as set out. PREFACE, TITLE, SUMMARY, GENERAL INDEX, ACKNOWLEDGEMENTS, AREAS, GLOSSARY, INDEX OF TABLES AND FIGURES, INDEX OF APPENDICES, INTRODUCTION. 01. THE DOWNLAND AS AN IDENTIFIABLE GEOGRAPHICAL REGION. 02. PREVIOUS LANDSCAPE DELINEATIONS AND THE DETERMINATION OF THE STUDY AREA. 03. THE INTRA-STRUCTURE OF DOWNLAND CONSERVATION. 04. THE DEFINITION AND NATURE OF TOURISM AND THE EVALUATION OF COMMERCIAL TOURISM RESOURCES. 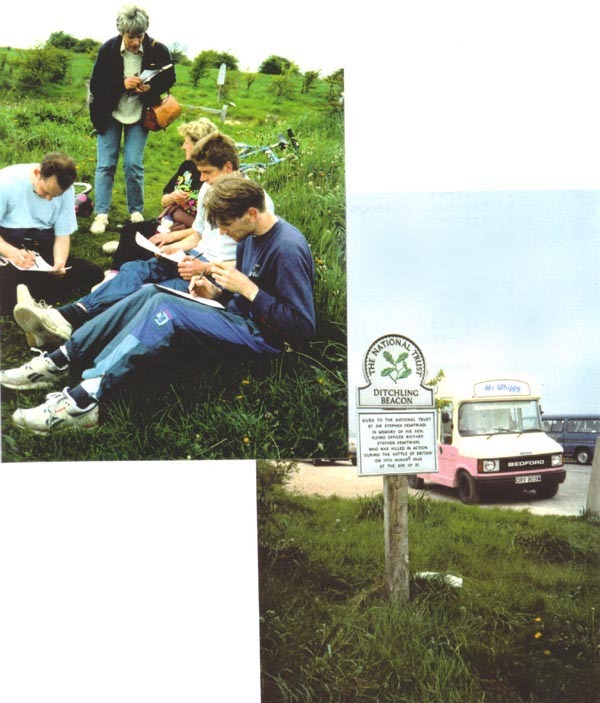 05. REVIEW OF EARLIER RESEARCH RELEVANT TO DOWNLAND TOURISM. 06. DOWNLAND VISITOR RESEARCH AND IMPACTS. 07. RECONCILING THE PRODUCT AND THE CONSUMER ON THE DOWNLAND. 08. DARTMOOR NATIONAL PARK TOURISM - A CASE STUDY. 09. MALVERN HILLS TOURISM - A CASE STUDY. 10. ORGANISATIONAL RESTRUCTURING AND MARKETING STANCE FOR TOURISM. 11. RELATIONSHIPS BETWEEN TOURISM, CONSERVATION AND THE NATURAL ENVIRONMENT. 12. ASPECTS OF DOWNLAND TOURISM'S SOCIAL IMPACT. 14. AREA OF OUTSTANDING NATURAL BEAUTY OR NATIONAL PARK? 15. PEOPLE AND PLACES - AN INTEGRATED LANDSCAPE. 16. SUMMARY, DISCUSSION AND CONCLUSION. Numbered footnotes are given at the end of each chapter with a full bibliography at the end. Funding for this research project came from a bursary award by the University of Sussex supplemented by funding for the Downland Visitor Survey from the Sussex Downs Conservation Board. This thesis is dedicated to my Uncle for my first introduction to the South Downs. In addition, my thanks go to the following who have been invaluable in assisting in the preparation of this work, listed in approximate order of consultation. and particularly Dr Brian Short for supervision, patience and extended debate and Sheila Martland for proof reading. Measurement of areas is given in hectares in the text throughout. 1 hectare = 2.471 acres, 1 acre = 0.405 hectares. 1 sq. mile = 2.59 sq km. 1 mile = 1.609 km. Sources: MAFF, Countryside Commission, SDCB, SEETB. ASA - Archaeologically Sensitive Areas. BTA - British Travel Association. CPRE - Council for the Protection of Rural England. DATI - Dartmoor Area Tourism Initiative. EC - European economic community. ESA - Environmentally Sensitive Area. ESCC - East Sussex County Council. ETB - English Tourist Board. FE - Forestry Enterprise, part of the Forestry Commission. MAFF - Ministry of Agriculture, Fisheries and Food. MHDC - Malvern Hills District Council. NPA - National Park Authority. RoW - Rights of Way. RSPB - Royal Society for the Protection of Birds. SATI - Sussex Area Tourism Initiative. SCOPAC - Standing Conference on Problems with the Coastline. SDCB - Sussex Downs Conservation Board. S.E. England - South East of England. SEETB - South East England Tourist Board. SSSI - Site of Special Scientific Interest. STDAP - Sussex Tourism Development Action Programme. TDAP - Tourism Development Action Programme. WSCC - West Sussex County Council. Core study area, the central zone for the purpose of this study comprising the southern chalklands of East and West Sussex as set out in Chapters 1 & 2. Peripheral area or zone, the land mass surrounding the core area which is seen as a necessary integral part of a tourism study as set out in Chapters 1 and 2. Downland, Downs, chalklands, a general term referring to the Sussex Downs and the chalklands elsewhere. Sussex Downs, those parts of the Downland located in the administrative Counties of East and West Sussex and forming the core study area. South Downs, the Sussex Downs plus that part of the Downland which extends as far as Winchester in Hampshire. Figure 1:1 Chalkland regions of England. Figure 2:1 The Sussex Downs Area of Outstanding Natural Beauty. 2:2 Proposed South Downs National Park. 2:4 The Sussex Downs Tourism Study Region. 3:2 National Trust Properties on the Sussex Downs. 3:3 WSCC Sites on the Sussex Downs. 3:4 Sites managed by Sussex Wildlife Trust. 3:5 Forest Enterprise Sites on the Sussex Downs. 3:6 Public Rights of Way on the Sussex Downs. 3:7 Estates on the Sussex Downland. 3:8 Protection Status and Role of Conservation Measures/Agencies. Table 4:1 East and West Sussex Visitor Attractions. 4:2 Principal Commercial Tourist Attractions. 4:3 Tourist Accommodation in Sussex. 4:4 Local and Regional Public Expenditure. 4:5 SEETB Income and Expenditure. Table 5:1 Overnight Tourism in Sussex. 5:3 Tourism by Quarter Year. 5:4 Day and Overnight Tourism. 5:5 Types of Overnight Tourism. 5:6 Demographic Profile of Overnight Tourism. Figure 6:1 Origins of Downland Visitors. Table 6:1 17 Sites for the Downland Visitor Survey. 6:3 Ranked Order of Facility Utilisation. 6:4 Activities Participated in on the Downland. 6:5 How Did You Find Out About this Place? 6:6 Economic Worth of the Downland. Table 7:1 Number of Visits per annum by Key User Activities. 7:3 Market Segmentation by Consumer Groups on the Downland. Figure 8:1 Dartmoor TDAP and Park. Figure 10:1 Downland Ownership by percentage. Table 10:1 Tourism Development and Conservation. 10:2 Who Owns the Sussex Downland? Figure 12:1 Downland Population Change 1981-1991. Table 13:1 Expenditure Segmentation by Type of Expenditure on the Downland. 13:2 Family/Group Expenditure by Type and by Principal User Groups on the Downland. 13:3 Expenditure by Principal user Groups on the Downland. Table 16:1 Percentage volume and value by principal user groups on the Downland. Collecting Visitor Survey data 1993. 1) Hay Tor in the 1920s and today - one of Dartmoor's most famous honeypots - only the vehicles give a clue to the 70 years age difference between these two postcards. 2) Widecombe 1920s-1990s - more than a quarter of a million people visit this village of just 60 permanent inhabitants every year, in spite of this it has changed little over 70 years. Taylor (in Hoskins) identifies the complete medieval landscape preserved, with village and church surrounded by farmland and the moor beyond. Young People Enjoying Themselves or an Unacceptable Alien Invasion that Offends Middle Class Value Systems? Malvern Gazette, 29 May 1992. The following appendices relate to Chapter 6 and are therefore located at the end of that chapter. Collecting Visitor Survey data 1993. What sort of Downland will these people expect? Ice cream wagons or open spaces? Will it be a recapturing of the past or a vision for the future? Forming part of the South Downs, the Sussex Downland, it is argued, is a distinct region of the South East that not only has special characteristics that differentiate it from elsewhere, but also has important recreational tourism and visitor resources. This thesis investigates the nature of tourism on and around the Sussex Downs. Of particular relevance is the impact of tourism on the natural and human environments. The value of the Downland as an important landscape resource has long been recognised and various measures have been implemented to conserve the Sussex Downs. The reconciling of the ideals and objectives of the conservation and public recreation movements, often seen in conflict, is a key issue in this study in that it sets the scene for future policy and management of tourism. WHAT IS THE NATURE AND IMPACT OF TOURISM ON THE DOWNLAND AND CAN TOURISM BE ORCHESTRATED TO ENHANCE RATHER THAN DEGRADE THE SOCIAL, ECONOMIC OR ENVIRONMENTAL WELFARE OF THE REGION? DOES THE PRESENT AONB STATUS PROVIDE THE MOST EFFECTIVE MODE WITHIN WHICH THE SOCIAL, ECONOMIC AND ENVIRONMENTAL WELFARE CAN BEST BE ENHANCED BY TOURISM OR IS NATIONAL PARK STATUS MORE APPROPRIATE? A key element in the development of the thesis is the involvement of the Sussex Downs Conservation Board. The close liaison with the Board's Members and Officers has meant that many of the considerations have already not only been debated, but acted upon, preempting in some instances the finished work. Such involvement by the Board has also underlined the need for a balance between theoretical and practical approaches to the issues explored. This thesis therefore not only explores the characteristics of the problems relating to tourism and conservation; in addition it proposes and debates solutions to resolve the issues raised. In this sense the thesis extends academic investigation into the realm of application and management planning in addition to the more orthodox investigation of underlying issues. This is carried out within the context of a socio-economic study. The first three chapters are devoted to data gathering in order that the nature of the Downland can be fully understood. This was necessary because of the absence of any recent appraisal and accounts for the extended length of this thesis. This situation is now being rectified by the Countryside Commission who are initiating a full landscape assessment study. Much of the work carried out for this thesis will therefore be replicated in the resulting publication. The thesis then goes on to explore tourism in the context of the Downland: what is tourism and what previous research is relevant? The absence of Downland specific data in turn prompts a new research initiative which is detailed in Chapter 6. The findings of this initiative are developed further in Chapter 7. Two comparative case studies are then conducted and the conclusions give rise to a debate on how tourism needs to be orchestrated on the Downland. The groundwork is then set for evaluating approaches to and impacts of tourism using environmental, social and economic conceptual frameworks in Chapters 11, 12 and 13. Chapters 14 and 15 act as summary chapters, developing the various issues that emerge from the earlier work and drawing conclusions on conservation designation and aspects of a fully integrated approach to landscape policy and management. The final chapter then debates the implications of the summary chapters in the context of the principal questions that the thesis seeks to resolve. It also comments on the application of the proposals and is able to draw conclusions from the earlier debate and compounded findings. Countryside management and tourism are dynamic subjects. Inevitably events occur after the research has been completed that are worthy of consideration within the debate. Just prior to final presentation of this thesis the Beachy Head restaurant burnt down and the new legislation for National Parks progressed further through the parliamentary procedures. Also the findings of the recent Royal Commission on Environmental Pollution report on Transport and the Environment are being considered. Every effort has been made therefore to incorporate recent relevant circumstances in this thesis up to the Spring of 1995. Hilditch N, 1950, In Praise of Sussex, Frederick Muller Ltd, London, preface. Landscape Design Associates, 1994, A Landscape Assessment of the Sussex Downs AONB, consultation draft, Oct.